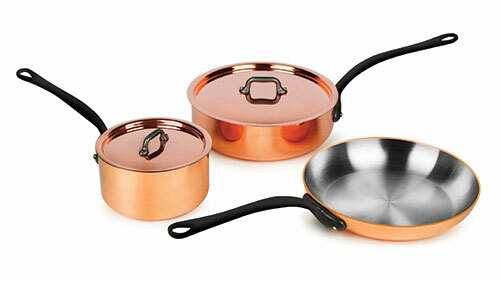 This past Christmas my husband gifted me with an intro set of Mauviel M'heritage 250c Copper Pans (thankfully on sale.) They are so pretty and fantastic to use...but I had no place to store them and I wasn't about to place those beautiful pans in a cabinet! So I searched online for a pot hanger and found one that I really liked on Amazon HERE, but unfortunately, its dimensions didn't work for our kitchen. Thankfully, I have a wonderfully industrious husband, who volunteered to make a similar rack of our own. We ordered the swivel hooks HERE, and the rest of the items came from a local hardware store, and our uncle's wood stash. I believe the wood he used is from a Kentucky Coffeetree. My husband formed and welded his own brackets and fashioned the rest after the one we found online.